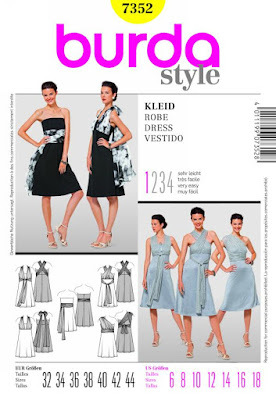 Ahhh Burda 7352 … it was the dress that had me going bonkers. My daughter asked me to make her a dress for a New Years’ Eve Party... like December 31st. To make matters even more bonkers, she wasn’t home and unable do any fitting….. double dayumm! Dumpster dived and did leaps and bounds to get the dress done and miraculously I was able to get it done, and she liked it. However, New Years Eve was coming to a close and when I peeped in on her to see if she was dress, my baby girl was sound asleep. So the dress wasn’t worn to the New Years’ Eve party. Fast Forward 2017 and I looooooooooooove this dress. Can you believe that I remember reading that post! Nice dress then and nice dress now!!! I agree with Faye, nice dress then and now. Wow, that dress look like it was perfectly made for you! Isn't it wonderful to be the mom of an adult daughter and still look hot too? A great dress reincarnated! Wow, kudos to you, both then and now. I love the last pic with the 3 straps. Somehow looks sexier IMO. Thank you Garnet128 ! The 3 strap is my favorite too. I ended up wearing the criss-cross style to the event. We have a great collection of African fabrics. Colorful and best quality at lowest price. For whole sell price Visit us, hope you guys love them.